« Why Is Nationwide Funding A Campaign Against The Teaching Of Basic Numeracy? I really should be in bed, but there was a lot of fuss on Twitter, TES and the Guardian about English GCSE results. Lots of claims about results being down. This may be correct, we simply don’t know yet. However, there seems to have been a distinct lack of serious thought about what schools should have expected from their results. It has been on the cards for a while that the number of grades given would stay roughly the same this year. This has been made clear to exam boards. However, it doesn’t seem to have sunk in with schools or teachers what this policy of 0% grade inflation would actually mean. 1) Most schools cannot expect their results to improve. If targets were set based on continuing improvement in results then they are unlikely to be met. 2) If the average improvement in grades nationally is 0% then (assuming a symmetrical distribution) roughly half of schools will get worse grades this year than last year. 3) If too many schools target what they think is a “C”, then they won’t get it. It is no good looking at January mark schemes, or previous year’s mark schemes, and trying to replicate was a C grade then. Everyone else will be doing the same thing and they can’t all get Cs. Boundaries will shift upwards. Furthermore the effects of these things I have described will be disproportionately felt by schools which have focused on improving their number of C grades. If you aimed for lots of low Cs then you are likely to be in trouble. If you relied on controlled assessments and coursework to get grade Cs (i.e. cheating), then it is almost certain the goalposts will have moved. The effects will also be felt more in subjects where marking is imprecise and arbitrary. None of the fuss so far has indicated yet that there has been a real problem with English beyond the failure of schools to realise the above. The culture of continual “improvement” (that actually just meant gaming the system) is quite heavily ingrained. An end to grade inflation will be a shock to the system with a lot of consequences for schools. We will find out tomorrow whether there are actual grounds for all the hysteria tonight, or whether it is simply down to the inability of school leaders to understand the concept of a zero-sum game. Update: The results are out. Apparently the change in English Language grades A*-C was a decrease of 1.5%. Dramatic in that one subject, but to be expected and nothing like the 10% drop the people in hysterics were claiming. Feel free to thank me for being right. If the grade boundaries moved ten marks between January and June, meaning that students who entered the same quality work, to the same question, are getting different grades then there is a problem. If I was the parent of a child who got the lower grade while a child next door got the higher grade – solely down to the fact that one teacher handed their coursework to the exam board in an earlier month – I would be rightly aggrieved. Whether or not schools need a shock to the system is a separate issue; even if they do, it should not be done like this where the consequences are borne heavily by individual children who did not consciously game anything and now may have their future study plans rejected. The point is that those entered in January were doing a style of exam that nobody had ever seen before. Those in June weren’t, which would make getting a particular score easier. Normally we ignore that fact and just pretend students got smarter from January to June. With 0% grade inflation that can’t happen. You can argue that it is unfair (although perhaps the greatest unfairness is in the existence of early entry) but it should have been expected. As far as I know the students in June were also doing the exact same controlled assessment that no-one had seen before. The possible advantage the June students had was that some people had now been entered for the examination and they had the benefit of grade boundaries and an examiner’s report (though fairly late in the day; by the time this was released I expect most schools would already be halfway through the CAs). However, this doesn’t make getting a particular score (ergo: grade) *easier*. It may make it more likely; it may mean that teachers push students to get a certain score on the rubric because they know that a certain score is, say, an rather than a B. But it doesn’t mean that the actual getting of that grade is easier because regardless of what has come before, the task is essentially the same. Otherwise we might as well say that because Usain Bolt ran 100m in a time never seen before the 100m suddenly became ‘easier’ for others to achieve it. Clearly that isn’t true; running a 100m is equally as difficult one month to the next as is doing the same controlled assessment in January ro June. BUT, it becomes more likely that others will achieve something once a first person has done it, hence why when a world record is broken that score tends to start being achieved by other people too. But it’s not like a 100m is it? There are plenty of sports where time spent getting to know the track/pitch does make a difference. It is absurd to think that identical exams can be taken at different times of the year without there being a significant advantage for the people taking it later. I think banning controlled assessments and early entries is a fairer way to solve the problem than moving boundaries during the year, but there’s no pretending there’s the same amount of challenge both times. But no-one says the grades are there to reflect level of challenge. They are marked on subject-specific performance indicators. They don’t say that if they think solving a quadratic equation in June is easier than in Jan then it should only be awarded 2 marks not 3. The mark scheme says that a certain level of competence, however challenging it was for you to reach, should attain a certain grade. Like running against a clock for time reading. If it’s about level of challenge, shouldn’t private schools have their results slashed in half? If grades are not there to reflect challenge what use are they? Obviously they can’t reflect the challenges of personal circumstances, but they should definitely reflect the challenges raised by the structure of the exam. Hah! Well said! A school I worked at had a motto: “Improvement is Limitless”. Noone else seemed to noticed the logical mistake with these words. This ignores the fact that schools are under enormous pressure from the top to make year on year improvement. The 5 A*-C target is 5% higher this year than last and will be 5% higher again next year than this. It is hard to see how raising the target by 5% while at the same time manipulating grade boundaries to lower the pass rate is anything other than a deliberate ploy to make schools fail for political purposes. Kids are the losers. Obviously continuing improvement in results will be impossible for most schools. But it seems to be schools that need to realise that most. There are some valid points here, but I think the haste in putting this out while still extremely relevant leads to some content I’d take issue with. My biggest problem is that you’ve said “doesn’t seem to have sunk in with *schools and teachers* what this policy of grade inflation would actually mean” when I would strongly suggest that should read, ‘Government’. Michael Gove has alluded strongly to the idea that virtually all students should be getting grade C if their teachers are good enough and their schools managed in the right frame (read: are academies). David Laws said directly in his first big policy brief to return to the political spotlight that it was only acceptable as a long-term vision for students with identifiable disabilities or learning difficulties not to receive Grade C’s. There has been a continual culture of anyone speaking out about grade inflation as being either a)simple cheats covering for their own teaching inadequacy by operating outside the rigorous ethics that everyone else is using to improve grades by better teaching, or b)people who are acceptant of failure and don’t have high enough expectations, particularly for poor students. All of these assume, most importantly, that a ‘C’ is a fixed objective measure in which students compete against a performance standard (as in a hundred metre race where grades are equivalent to times), and completely not a relative measure of performance (as in, say, a football league table) against others under the same conditions of performance. This may be a favourable system (and it may not), but is certainly not an existent system. Whereas Coursework used to operate according to the former (direct assignment of a grade according to objective quality), Controlled Assessment now runs according to the latter, as raw score is converted to UMS first by the exam boards which are variable according to cohort performance, and only then into grades. Exam scores have always operated to some degree under this system, in which you would expect a bell curve of normal distribution. This creates a prime conflict between how teachers are rhetorically imagined by the government’s assertions and targets, and how performance is processed. And this disingenuous approach continues. Gove’s first contribution when interviewed by the BBC today was to congratulate hardworking students who got the grades; his second was sympathy for hardworking students who hadn’t, and that hopefully with the right support they could achieve those grades. That means resits, which he has previously speaking out against and is now using to avoid flak for allowing interference between measures of objective performance, and measures of return. We are left with Goverment saying that everyone can get a C in a measuring system which cannot allow that to happen, saying they want greater rigor in content and then conversely springing greater rigor in marking, saying they hate resits but using them to mollify parents and students, And saying that it’s poor teacher performance that creates the inevitable gap. If your school’s results are below where they should be – your kids dont do as well as they would in another school, you a still able to improve your results. If they are about right then more realistic goals are sensible. I need to take issue with the ‘imprecise and arbitrary’ comment. I can just about take imprecise to describe the marking of my subjects, history and politics. However, there is no excuse for it being arbitrary. Every year one of my sets of results shows an examiner has been rather arbitrary which is a continual frustration- but this is largely avoidable with better procedures in place from exam boards. 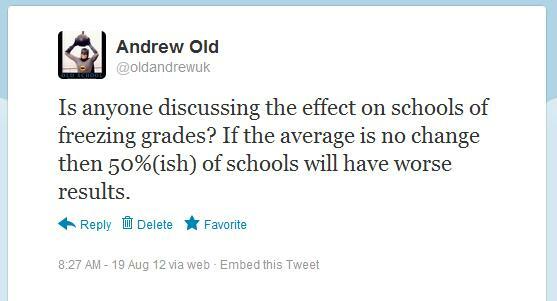 My point was not about the subjects in general, but about the GCSEs as they are now. I am of the view that a lot of exams can be made a lot more precise and far less arbitrary if they were less shy about explicitly testing knowledge. Simon, excellent post- it always amuses me at this time of year when so many people misunderstand the system and Im delighted that you, and OA, have illustrated the issues so well. eg. I think all kids leaving primary school should be able to read and write to a reasonable level unless severely SEN. I think its reasonable to expect students at 16 to be able to write a flawless CV and letter of introduction without help. Doesn’t have to be Booker Prize standard- just spelt correctly with appropriate grammar ‘innit cuz’. Clearly if we were to work these miracles and we were getting kids of 16 to the correct proficiency then I don’t mind what grade system they use. They can use normalisation, past cohort comparison, bell curve distribution algorithms or alternatively have standardised tests with fixed grade boundaries. (No test system is perfect by definition anyway). Who cares? As long as the kids get to a decent standard of speaking, reading and writing and thats apparent to the public, employers and teachers.